Wow. I was really, really looking forward to reading this one. After all, what could be better than a memoir about a guy who loves books so much that he dedicates his life to them: writing them, editing them, adapting them for screenplays, collecting them, dealing them. This is so right up any book-nerd's alley, and it doesn't take much to know I am just that book-nerd-type. 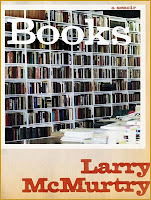 But despite the subject matter, Larry McMurtry's latest release, Books, will remain half-read on my shelf, and I'm debating even allowing it to keep that rare bit of open real estate. McMurtry's writing in this book is shoddy at best, and desperately in need of an editor. Please, someone, get rid of the exclamation points all over every page. Cut the "dialog." Snip the tedious tangents. Wait, though -- if any of this happened, we'd be left with nothing to read. Books spends so much time dedicated to the opening hours of bookstores (they are open quite late in San Francisco, I've now read a dozen times) and the bizarre, seemingly unimportant romances of fellow booksellers that to remove the tangents would be to leave the text devoid of any story at all. The already chaotic writing is only worsened by constant references to previous McMurtry titles, which, whether intentional or not, give the book the overall impression of a failed sales-pitch. Bottom Line: Skip it. Without a cohesive subject matter and/or decent chronology of events, no memoir will survive. Worse, this one delves into details you couldn't be bothered to care about while glossing over what might have been interesting. Writing like this promises to be disappointed to any booklover, regardless of subject matter.